On Wednesday, it almost seemed a throwaway question that revealed that AIB had in August 2012 shovelled €1.1bn of the €20.7bn taxpayer bailout into its pension fund to plug a hole which put at jeopardy “super pensions” payable to former executives at the helm of the bank during the boom which has now spectacularly turned to bust; it should be said that the pension fund also pays the more bread-and-butter pensions of former AIB employees who might have been on modest salaries. The transcript of the hearing is not yet available, so the deputy who first extracted the information from the AIB CEO David Duffy isn’t getting credit on here at this juncture. Since Wednesday, there have been a number of messages received in confidence on here which suggest that we have just scratched the surface of bank pension funds and how they were managed prior to the bust, their activities in supporting bank share prices and how they have had to be rescued by the taxpayer. It seems like there might be (several) huge stories there, but they will require resources for a subject that goes beyond the remit of this blog. What we know for now from the AIB hearing on Wednesday and the Bank of Ireland hearing on Thursday is that pensions of €500-650,000 are being paid to ex-AIB CEO Eugene Sheehy and ex-BoI CEO Brian Goggin. The AIB pension fund was topped up with €1.1bn of funds that can be attributable to the taxpayer bailout. It seems that the BoI top-up was not disclosed but BoI has to date received a gross bailout from the taxpayer of €4.7bn. What we don’t appear to know if pension funds at Anglo or Irish Nationwide – now merged into IBRC – or at Irish Life – not split between Permanent TSB and Irish Life – or at the Educational Building Society, have been topped up with taxpayer funds. Nor do we know how exposed the banks’ pension funds were to shares in their own banks – after all we know that Anglo was keen for the Maple 10 to acquire shares in their bank, it is hardly beyond imagination that the Anglo pension fund also invested in Anglo shares. This whole area seems to have received little oversight or scrutiny to date. And on a related subject, it is gobsmacking that AIB employees facing redundancy may get 5-6 weeks salary per year of service whilst Vita Cortex workers had to stage a sit-in earlier this year to secure just 2.9 weeks per year of service. Vita Cortex didn’t need a €20.7bn bailout from the taxpayer. So here’s your blogpost to hang comments on. It will be updated when the transcripts become available, and judging by the volume of messages received, there may be further revelations which will also be posted here. Tullamore Beta Limited, the owners of the TV3 channel, Ireland’s second TV channel and its main so-called commercial channel, published their financial results for 2011 during the week. Remember this is the group with €140m of borrowings from state-owned IBRC which has agreed to park €80m of the debt pending what is understood to be a future sale of the channel by the main investor Doughty Hanson. The channel lost €7m in 2011, and apparently the advertising market in 2012 places another juicy loss on the cards in 2012. There was surprise that Doughty Henson were paid €3m in interest last year on loans, whilst IBRC didn’t receive a sausage on the €80m that has been parked. Over at Independent News and Media, things seem to have gone from bad to worse, with the share price touching 8c on Thursday valuing the company at just €40m before recovering on Friday to 9c. When the new CEO of IN&M Vincent Crowley took over in April 2012, he described the financial condition of the company as “perilous” and with borrowings of over €400m and a balance sheet that is insolvent to the tune of €205m at the end of June 2012, that assessment seems sound. Yesterday, staff at IN&M were briefed on the so-called Project Resolute, the name given to the initiatives to restructure the IN&M business and bring it back from the brink. Apparently redundancies and further pay-cuts are on the cards and there is going to be some merging of operations between the Independent and the Evening Herald. In Court 6 at the Four Courts yesterday, the judge Ms Justice Elizabeth Dunne, presided over a packed court-room as she read out her judgment on Sean Quinn senior’s conduct in a scheme to place assets beyond the reach of his creditor, the former Anglo Irish Bank now known as IBRC. Sean Quinn himself sat immediately behind his nemesis Mike Aynsley, the CEO of IBRC with the slighty Disneyesque face. About two thirds of the way through the reading out of the judgment, Sean’s face winced as if he was mouthing “giddy-up” to a cow, as he realised the confirmation of a jail sentence was coming. But the whole tone of yesterday indicated that Sean knew he was going to jail. Two weeks ago at a previous hearing, the court-room was packed to the gunnels with a phalanx of burly-looking Sean Quinn supporters – these supporters were missing yesterday and there was a more subdued, less threatening base of supporters present. Judge Dunne read out her judgment dispassionately and there was no personal comment or provocation, save for comments that had been previously made. Was Judge Dunne sensitive to criticism directed at her, herself over the summer? And coming on to the surprise.. The judge imposed a term of nine weeks which juuuust about envelopes Christmas and New Year, two occasions that you would expect to have deep significance to Sean Quinn the 66-year old patriarch with a large family. You would wonder what calculations went through Judge Dunne’s mind when arriving at a precise nine weeks. But the main surprise was when Judge Dunne, having delivered her sentence, sought to establish if the sentence would be appealed, and Sean’s barrister told the judge that he would consult with his client to see if he wanted to appeal. It seemed the judge expected the sentence to be appealed and a stay on the sentence to be sought pending the outcome of that appeal but Sean came back and decided to start the sentence there and then. For what very little it’s worth, there is wholehearted support for a “Yes” vote in the Childrens Referendum next Saturday. It is worrying though, that we live in a republic with a constitution which presently doesn’t protect children or offer them basic opportunities being promoted in this campaign, and that we can’t achieve the objectives promoted in the campaign through changes to legislation. On Thursday, the High Court dismissed a challenge by citizen Mark McCrystal to stop the referendum on the grounds that there was bias in favour of a “yes” vote in the Government’s position. 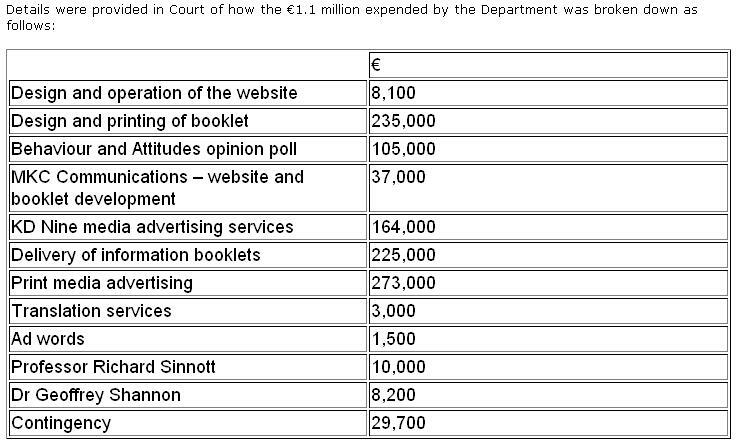 He provided the Court with an intriguing list of costs which the Government is directly incurring – shown above – and, in addition the Referendum Commission is set to cost us €1.9m. There is to be a Supreme Court appeal on Tuesday next 6th November, of the High Court judgment. That didn’t stop Minister for Finance Michael Noonan on Thursday last claiming that the Government had won the Supreme Court appeal – increasingly you have to double-check any utterance from the finance minister. In the High Court yesterday, Ms Justice Elizabeth Dunne peppered her sturdy judgment in the Sean Quinn case with the term “contemner”, one who views something with contempt or in a legal sense, one who is judged in contempt of court. Sean Quinn was adjudged a contemner and has now started a nine week stretch in the ‘Joy. But this was the week when one of Ireland’s most senior bankers, the chief executive of Bank of Ireland Richie Boucher was accused of treating an Oireachtas finance committee with contempt with his minimalist and allegedly-evasive answers. And over in the US which is set for its presidential election on Tuesday next, Republican Mitt Romney was accused of showing contempt for the 47% of Americans excluded from the benefits of his crusade in life. And spare a thought for the producers of “Anglo: the Musical”, who are not in contempt of court, but they apparently risked prejudicing the forthcoming criminal trial of former Anglo chairman, Sean Fitzpatrick and others, and the producers have now had to agree to drop the inclusion of Sean Fitzpatrick’s character in their show. Which is going to pose enormous challenges to the production. A little like “Jaws” without the shark. The show will be performed at the Bord Gais Energy theatre in south Dublin Docklands from 14-25th November, 2012 – details here. The US was hit by Hurricane Sandy during the week which caused devastation across the north east of the country, but spare a thought for the marketing folks at Kellogg’s which produces “Special K” the diet breakfast cereal. 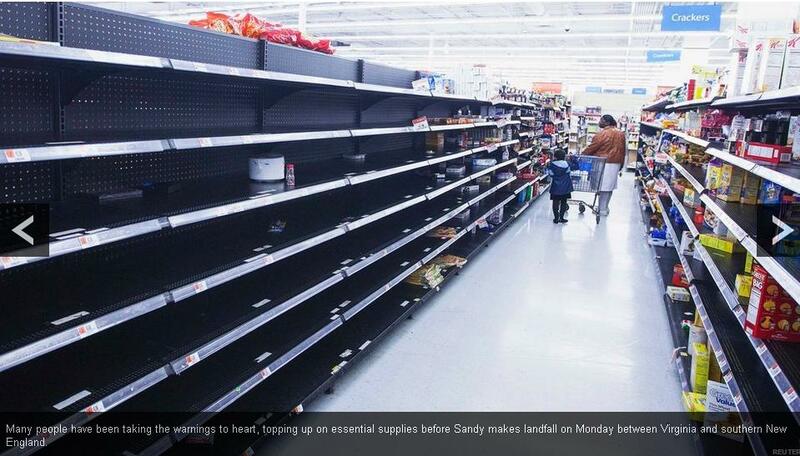 In the depths of the crisis when hordes had bought nearly everything off the shelves of US grocery stores, they left behind Special K – above photograph, top right. Just how desperate do we have to be to buy it? Just keep that in mind next time Kellogg’s promotes the cereal with a bevy of sylph-like loveliness. So now, we are just “one” of the shining examples. You might be scratching your head to identify the “other” shining examples. And you might be a little crestfallen to realise we’re not as “special” as we were given to believe. Okay, you can probably dismiss any pronouncement from the Department of Finance as spin with a soupcon of simulation and dissimulation. But at least the national media should have been able to tease apart the strings of numbers in yesterday’s Exchequer Statement and conclude that instead of taxes being up and the deficit falling, that we are now seriously off plan for the year with taxes DOWN on plan and the position deteriorating and costs UP on plan though the mess is being masked by the Government cutting back on capital spend. And “capital spend” might sound vague, but this is OUR money which we have given the Government in taxes which the Government promised to give BACK TO US with spending on projects in the economy, spending which would generate economic activity, reduce unemployment and improve our infrastructure and competitiveness. To the end of August 2012, we had collected €22.1bn in taxes which was €365m ahead of plan. Excellent. Except there was a late receipt of €250m in corporation tax which arrived in early January 2012 and has been regarded as rightly belonging to 2011 rather than 2012, though as the year has progressed, it seems this is being downplayed by the Department of Finance. But even so, taxes ahead by €365m or €115m when you deduct the €250m corporation tax idiosyncrasy is still positive. However, by the end of October 2012, we had collected €28.35bn which was just €96m ahead of plan and once you deduct the €250m idiosyncrasy we are actually behind plan to the tune of €154m. This represents a marked deterioration from August 2012. On the spending side, to the end of August 2012 we had spent €29.6bn which was €317m ahead of plan due to nasty Minister James Reilly and his failure to deliver reforms to health and nice Minister Burton whose social welfare budget is blown by worse than expected needs. There are two components of spending – current and capital. Current is what we spend week-in, week-out on salaries and other short-term benefits. Capital is what we spend on developing our national infrastructure – roads, hospitals, prisons, schools but also energy, communications and recreation. The current component of spending at the end of August 2012 was €28bn which was a stonking €437m ahead of budget. But we were underspending on capital to the tune of €100m. So it was bad even in August 2012. But take a look at October’s Exchequer Statement. Total expenditure stands at €36.7bn which is just €88m ahead of budget, but within that current expenditure is €424m ahead of plan, marginally better than the €437m overshoot in August year-to-date. But capital spending is now down an incredible €336m from plan. Overall in August 2012, we were €202m worse than plan when you considered taxes and expenditure together and excluded the €250m idiosyncrasy. At the end of October 2012, we are €242m worse than plan, which represents a slight deterioration, but when you consider that it is the Government cutting the capital programme which is stopping the figures being worse, you are entitled to feel concerned and angry. We have had to give Roisin Shortall a €33,100 severance payment after SHE resigned from her junior ministerial post and the Government makes up this overspend by cutting the capital programme which would generate economic activity in the real economy – it is infuriating. If the Government was spending the capital budget to plan, then, overall at the end of October 2012 and excluding the €250m idiosyncrasy, we would be €576m off plan – this is getting serious. We know from Department of Finance and NAMA projections that €1bn of capital spend equates to 10-17,500 new jobs in the economy. So €336m would equate to 3,000-5,000 new jobs. Remember this is OUR money and also remember that the overspend on current spending is down, in a large part, to Minister James Reilly’s failings to deliver reforms to the health budget. A new virulent strain of Small Dog Syndrome has recently broken out amongst ministers and even economists. It seems we now firmly believe that Europe’s largest economy and the EuroZone’s strongest member – Germany – that its sole obsession is that Ireland will successfully emerge from the financial assistance programme – aka “the IMF/EU bailout” – at the end of 2013 and will be able to access funds from traditional lenders at reasonable interest rates on the international bond market. Ireland’s debt:GDP instead of falling back to about 100% as planned, is actually at 189%. How could this apocalypse come about? Let’s say Eurostat decide that NAMA’s bonds should in fact sit on the national debt which would boost debt:GDP by 15% and remember we have the ipsissima verba of Minister Joan Burton that NAMA may make a loss of €15bn. In addition, let’s say the European economic crisis is still not solved and that more countries have tipped into recession because of the ECB insistence on keeping a cap on inflation and demanding deficits be dealt with through austerity. Let’s say our politicians plumb for soft options – for example, cutting the capital programme – to close the 9% deficit and the effect of those options is to stymie recovery. Let’s say the mortgage crisis overwhelms our banks and eventually there is a stronger bankruptcy regime which means the banks incur large additional losses and the State bails them out again. And lastly remember that in Ireland, a debt:GNP is widely seen as more comparable with other countries’ debt:GDP, that that pushes up debt by 20%. What blind bit of difference would it make to Germany in 2017 if Ireland had a debt:GDP that mirrored Greece’s actual projected debt:GDP in 2013? Might Germans just shrug their shoulders and correctly dismiss our plight as the result of failing to get our deficit under control when the banking/property sectors collapsed in 2008, AND the decision of our State to guarantee and bail out massive losses at our banks? “The Irish, a tragic people” they might kindly say in 2017. But Europe needs a success story, say the Small Dog Syndrome folks, which this week include economist David McWilliams. Maybe Europe does, but if it does, it is more likely to be preserving the economies of Spain, Italy or indeed France. As for Ireland, the country on the geographic outskirts of Europe just below Iceland, with a population of less than 1% of the EU’s and with an economy hugely boosted by the presence of US IT and medicine companies – companies which Germany might like to see located on its territory, and whose low corporate tax rate of 12.5% is seen as anti-competitive; if Germany can stomach a debt:GDP in Greece next year of 189% then if we can cast off the Small Dog Syndrome for a moment, we might realise that Ireland having a 189% debt:GDP in 2017 is no big deal in the overall scheme of things.